This guest post was written by Alex Ahlund, the CEO of AppVee and AndroidApps, which was recently acquired by mobile app directory Appolicious. He is currently an advisor to Appolicious. Apple is hailing the iPad as a “magical” and “revolutionary” device. Perhaps, but the feature set accompanying the first version leaves many of us skeptical of that claim. We’ve all seen tablets before and we’re already seeing similar ones coming out soon with better specs. What we need to consider more than the device itself are the effects its release will have on the market. The iPad could potentially usher in a new set of casual users who may not already be iPhone or iPod Touch owners. This is good for business across the board, but the area that may be impacted the greatest is the iPhone gaming industry. The current iPhone and iPod touch gaming landscape consists of pick-up-and-play micro games, watered down console ports, and some in-between titles. It’s hard to consider the iPhone a true gaming platform. The lack of physical buttons, coupled with the scarcity of deep, quality titles, may prevent the iPhone from ever becoming a true competitor to the Nintendo DS or Sony PSP. Unfortunately, there are even more issues that further intensify this problem. The first is price point. Given the average game is sold for $.99 and the most expensive are $9.99, App Store prices differ wildly from other game markets. Even the downloadable casual games industry spans $10 – $20 on average. Think about this. Many of these are the same games that get ported to the iPhone. Not only are the games the same, but the target demographics as well. So how did this happen? The fault lies with developers and consumers alike. Price is extremely psychological and both sides equally contribute to setting that standard. Prior to being involved in the iPhone industry, I worked for years in the casual games space. I saw the evolution of downloadable gaming go from the traditional core download.com-style shareware model to a full-blown casual gaming industry that catered primarily to 40-something women. To say the least, it was a stark contrast. Now, the most interesting component was seeing how price was affected when it moved from the underground to the mainstream. In the old shareware days, pricing was not uniform. It was the Wild West. But when the big guys (AOL, Yahoo, EA, PopCap, Big Fish, etc.) started to catapult the casual space, pricing had to be regulated for the psychological comfort of mainstream audiences. At the time, the sweet spot was $19.99. Some of those portals would sometimes try to undercut one another, but in the consumer’s mind, it felt suspect to pay significantly less. Alternatively, these portals went another route – subscription services, which offered deeply discounted pricing models. I bring this up to provide a better understanding of pricing psychology. It first starts with what the industry as a whole unofficially agrees the average price of a similar product should be. This is determined with some guesswork and tweaking, while waiting to see what the market will bear. As time goes by, competitors start to undercut each other and the industry either follows suit or holds steady to that original average. Unfortunately, the iPhone game industry chose the former. I say ‘unfortunately’ because it is severely crippling the gaming space. When the 3G was first launched, $9.99 was the average price of a decent, quality game. At the time, it was a fantastic price when we considered what DS games, downloadable titles and even those budget CDs at Walmart cost. This was not a lasting trend, though. As more developers flooded the market, prices continued to be pushed lower and lower. What drove this price drop was mainly gimmick apps and cheap games. The problem was that even though these products were clearly of lesser value and depth, the damage had already been done. In the minds of the consumers, paying $10 for an iPhone app, let alone more, had become a huge stretch. Instead of buying a new title at $9.99, most consumers simply waited for “the drop” – the inevitable price slash that developers enacted shortly after a game’s release. It was no longer a value proposition; it was a somewhat illogical psychological standard that had been created. Most developers had to learn to flow with this changing market, embracing the fact that shear volume could often make up for their development costs. Typically though, these development efforts were focused on low-priced impulse apps. This is where the damage to the industry comes in. Since expected pricing is so low, it discourages quality game contenders from entering the space. The cost investment is still high to produce a quality product, especially considering the average sale prices are so low. To address this problem, one rumor we heard a number of months ago was the possibility of Apple opening a premium game space on the App Store. The intention would be to feature higher priced, higher quality games. So far, nothing has come of this. In effect, this is keeping the iPhone gaming industry as still just typical mobile fare, with the occasional big game. As much as Apple wants this to be a serious competitor to the DS/PSP, it will never make it unless there is a shift. Indirectly, this is where the iPad comes in. One of the biggest reasons that gimmicky apps and quick pick-up-and-play games have done so well is because the iPhone and iPod Touch are products that fit in your pocket. Typically, you take them everywhere and they are always within reach. This allows for the majority of use to occur within short periods of time (i.e. waiting in line, on the bus, during a boring meeting, etc.). To fill the needs of those sorts of time constraints, short-use applications fit the bill. This limits the desire for a deep experience or time consuming game. The iPad changes this. As a device that works as an in-between for your mobile device and your desktop, the time use allowance goes up dramatically. In most situations, you won’t pull out your iPad while waiting in line at the post office. It won’t be carried everywhere you go. While some will treat it as a netbook substitute, I anticipate a lot of its use will occur casually at home. Since the iPad is not a pocket-sized device like the iPhone and iPod Touch, time constraints become less of an issue. This means that bite-sized games or gimmicks will feel less at home here. Something like Doodle Jump will most likely not do so well on this platform. This is likely to cause the market to desire more fulfilling experiences, especially in the games space. In effect, developers will respond accordingly to meet this new market need. This acts as one phase of the changing landscape. There is an additional psychological component that hasn’t yet been addressed in regards to pricing: size does matter. Whether it makes sense or not in terms of value proposition, the actual size of a product can have some bearing on how we perceive its value. The small screen size of the iPhone and iPod touch causes us to perceive, whether consciously or unconsciously, that the applications are worth less than something you can interact with on a big monitor. Diner Dash on the iPhone is identical to Diner Dash on the PC. Yet, the price points are dramatically different. One aspect is market-determined pricing averages and the other is perceived value. Many consumers perceive a higher value from their larger screened PC experiences. The additional screen real estate of the iPad makes apps feel more like “real” applications. Visual interaction with the iPad screen feels closer to that of a monitor or TV. It removes the notion of the “pocket-sized time waster” and seems to provide a more substantial experience. Take a game like Civilization Revolution. Which experience feels more enriching: playing it on the small screened iPhone or playing it on a full sized device with many times the screen real estate? Despite being the same game, more breathing room provides for a deeper and more enjoyable experience. This will start a new cycle for the App Store. Reduced price sensitivity will create opportunities for deeper games and apps, which will then help set a new pricing standard. $.99 gimmicks will always exist, but now alongside a new wave of higher quality products. The goal of developers is to increase revenue at every possible avenue. This means creating a product that can span multiple platforms. Unless highly specialized, apps work just as well on the iPod Touch as they do on the iPhone. The same should hold true for the iPad. By reducing focus on one of the platforms, you start losing a whole market segment – and additional revenue source. However, simply upscaling current applications is a very short-sighted solution. It is a way for Apple to capitalize on the 150k+ apps out there for their new device, but this isn’t going to work for the longterm. Using an application unoptimized for a larger device, and not tailored for the iPad’s greater screen real estate, will feel like a tacked on experience. Because of this, more users will want to download iPad-specific applications to take advantage of their shiny new device. For some products, such as 3D games like N.O.V.A, upscaling may not be an issue. These games can scale with ease, with only slight modification to interface images. But for the rest of the app work, doubling the pixels is going to be a complete mess. Now what effect does this have on gimmicky apps and games? It forces these developers to rethink their model. As we discussed, when you develop an app, you want to capitalize on all revenue streams possible. If you produce a product that only makes sense on the iPhone, you will miss out on new opportunities provided by the iPad. 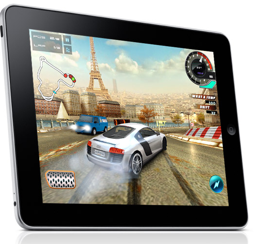 Short lived gimmicks and micro-gaming experiences are unlikely to fare well on the iPad. The effect of this realization may likely cause a decline in small sized, $.99 apps as a whole. There will always be a place for these, but to really maximize profit potential, focusing on them solely is a short-sighted plan. The iPad is a device that may be misunderstood for a while. It’s certainly not revolutionary in the typical sense, but its subtle influences may eventually justify that characterization. We can surely expect to see even more casual users jumping on the band wagon and certainly a spike in casual game development for the device. As the product evolves, becoming more powerful feature-rich, it may become even more ubiquitous than we expect. This will be an extremely interesting space to watch within the coming months and years.